Japan has flocks of foreigners going there each year either for tourism or to start a new life. As is usually the case with non English-speaking countries, your best chance for getting a job will be to teach English. Also, many foreign companies have offices in Japan (Tokyo, Osaka, etc. ), so, with some slick networking, you might be able to convince your employer to get relocated to Japan. Also, if you manage to get a job in Japan, I will be very jealous of you because I like sushi. Below is a selection of resources for searching for employment opportunities as a foreigner in Japan. Jobs in Japan: Jobs in Japan is an excellent website with a plethora a jobs for English speakers. A lot of the jobs are in Tokyo, Nagoya, and Kyoto. This site is a good place to start your search. Japan Guide: If you follow the appropriate links on Japan Guide, you will turn up quite a few job postings in Japan. CareerJet: I’m sure you know CareerJet. They are a mega international job search engine. Indeed: I’m sure you know Indeed as well. It is another mega international job search engine. DaiJob: Comprehensive multilingual job listings. GaijinPot: This site doesn’t just have jobs…it also has listings on apartments and other items of interest for expats in Japan. Hello Work: Hello Work could use a facelift on the interface like a lot of the sites I have mentioned in this article. However, the job postings are plentiful and solid. Tokyo Connections: TokyoConnections rates the major job search sites for Japan. Career Cross: Career Cross has bilingual job results in Japan. Japan Times: Japan Times is the job search arm of the Japan Times. Japan Recruit Net: Japan Recruit Net has a simple Indeed.com style interface. Teaching English will be your easiest option (if you are a native English speaker that is). All of the sites below are pretty similar and have a massive amount of teaching English job options. 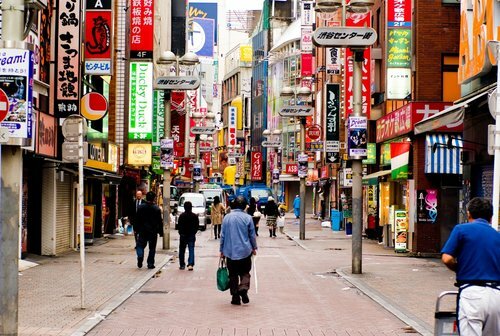 Browse through each of the sites for any Japanese job opportunities. Also, be sure to check out this cool table from the International TEFL academy that shows how much money teachers can expect to make in various countries around the world. The Jet Programme is well known and is run by the Government of Japan. I actually know a couple of people who have participated in it. Essentially, the Jet Programme is designed for foreigners who want to come to Japan to participate in cultural exchange. Most of the positions in this program are for teaching English, but if you’ve got some good Japanese skills, you might be able to get jobs doing other things. Jobs in Japan: This site is great for English teaching jobs. Transitions Abroad has a thorough post with useful links for living abroad in Japan. eFinancialCareers: My favorite search engine for finance jobs on the web. I used them during my Wall Street days. They are limited for Japan though. There you have it. The best places to find jobs in Japan as a foreigner. For information on visas for Japan, be sure to check out my Japan visa page. If you are single and are looking to spice up your dating life, check out my reviews of the best dating sites in Japan.